The two Koreas have completed their joint inspection of a waterway along their western border aimed at easing access to its restricted estuary following a September military agreement signed between the two sides, the Seoul government said Sunday. The 20-member team officially ended its 35-day survey of the mouth of the Han River, the Ministry of Oceans and Fisheries and the Ministry of Defense said in a joint statement. The hydrographic survey measured the waterway so as to eventually allow civilian access, including making passages accessible to private ships. It has discovered 21 reefs and they will be marked on a map that a South Korean state institute plans to produce by early next year, according to the ministries. "The ministry anticipates free and safe civilian access to the river," the oceans ministry said. "The easing of military access to the restricted estuary has set conditions for the establishment of another location that can represent peace," it added. 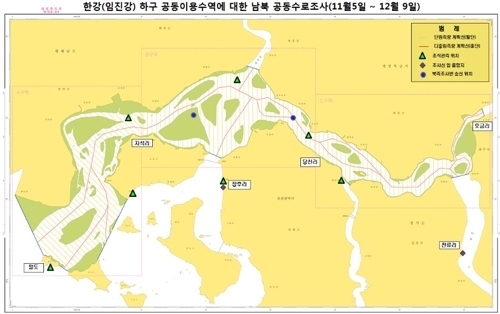 The waterway survey along the western border was conducted to facilitate joint use of the estuary of the Han River, where civilian access has been restricted due to military tensions. The joint survey is another step in easing military tensions along the tensely guarded western border after the leaders of the two Koreas held their third summit in Pyongyang to improve peace on the Korean Peninsula.